One of the most common problems I experience when playing movies and videos on my home PC is poor lip syncing caused by the sound and video not marrying up perfectly. Rather than performing any degree of troubleshooting I always fall back to the trusty player ‘Media Player Classic Home Theatre’ which despite a complete lack of both bells and whistles always performs admirably. The user interface for Media Player Classic looks just like the old Windows Media Player 6.4 which was bundled with Windows ME and early versions of Windows XP. I expect few users to know this specific version off the top of their heads so simply refer back to the version in your memory that could be described as looking ‘particularly primitive and dated’. There are no fancy skins, no modern looking icons and no ribbon style interface; what you simply get is a blank screen along with play, stop, pause, rewind and fast forward buttons, a volume control and a series of options running along the top of the application in an old school grey drop-down menu. The compensation for the primitive looking interface is that the 3mb application is capable of playing a huge number of audio and video files without the need for any additional software or codecs. Out of the box Media Player Classic Home Theatre includes support for MPEG-1, MPEG-2 and MPEG-4, VCD, SVCD and DVD playback. It also has built-in codecs for LPCM, MP2, AC3 and DTS audio along with H.264 and VC-1 with DXVA support, DivX, Xvid, and Flash Video formats. Media Player Classic Home Theatre can also support Quicktime and Realtime formats with the use of additional software. 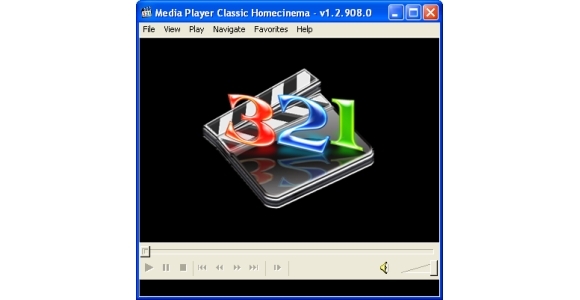 The player is based on the old Media Player Classic application which was being developed up until the original author ceased development back in 2006. In the last few years, asides from the name change, a number of new features have been integrated in to this new release including additional video decoders, several bug and vulnerability fixes and a 64-bit version for those with compatible versions of Windows Vista and Windows 7. The main appeal to me has to be the sheer simplicity of the application; it will load in literally a second and rarely skips a frame or misses a beat. If I ever find myself in a situation where a more ‘advanced’ player is struggling then immediately I’ll load up MPC Home Cinema and on the same PC with the same video file the problems cease. The low resource requirement means that it’s suitable for use on low specification machines making it especially tempting for those that can’t run the latest version of Windows Media Player. Downloading a copy will take literally a few seconds from http://mpc-hc.sourceforge.net/ and as with all good software it is free of charge and doesn’t include any advertising.